A Vision of Neon is a story of two friends – one who survives the complex years of adolescence and one who does not – and the unconditional love and commitment between these young girls. Wild, sharp-tongued red-head Kelsey embodies the confidence that her shy and quiet best friend, the story’s narrator, only dreams of. But as time passes, Kelsey’s seeming confidence and acts of teenage rebellion become overshadowed by day-long crying spells, invented stories of fictitious friends and thin slashes of scab that mark her skin. In high school, Kelsey descends into mental illness, while the narrator attempts to maintain a normal teenage life, despite continuing efforts to support her suicidal friend. However, both girls must ultimately face one difficult fact: regardless of their longings, Kelsey’s sickness has a debilitating stranglehold on them both. I really enjoyed this story. Not a lot of teenagers have been exposed to mental illness or the unique circumstances surrounding psychological disorders. This is just a topic not socially discussed regularly with young adults. Seeing the struggle between Angela and Kelsey and their family dynamics was amazingly well written. A great many people find it too difficult to stay in the lives of people with psychological disorders or mental illnesses and the fact that Angela's family is supportive of the friendship is incredible. This book opened my eyes to what real friendship is. I would definitely recommend this book. It made me laugh and cry. It's one of those stories that make you question yourself and hope you'd be a good person if placed in a similar scenario. Disclosure: All opinions are my own. 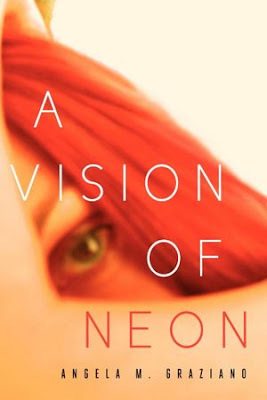 I received A Vision of Neon at no cost for the purpose of this review. No other compensation was received.